For all your gameplay related questions and issues, please consult their Frequently Asked Questions pages. They can be found at the following locations for Phoenix and Flare Elite. I lost my purchased ships because of a device restore, do I need to pay again? My purchased ships do not sync to my other devices, do I need to pay again? Then the answer is simple: no you do not need to pay again. 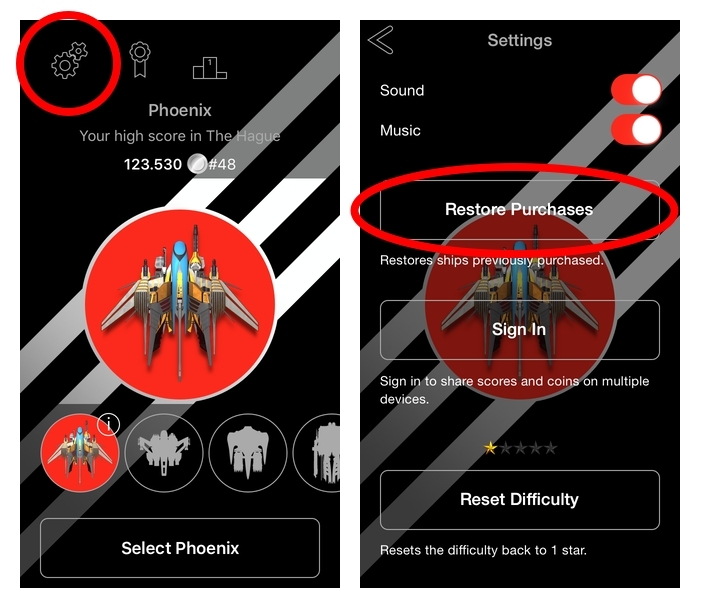 Your in-App Purchases can be unlocked using the 'Restore Purchases' button in the settings. The settings can be found in the Main Menu of Phoenix. After tapping the button you will need to log in to the App Store account on which the in-App Purchases were previously purchased. Please check the image below for a visual guide. Enjoy! Can other people see the locations of my scores? No. Your location is only used to determine the regional leaderboards for that score and then to show your own score on the screen after a game, and on the 'Your Highscores' map. Other players will never see your location. I have disabled Location Services yet Phoenix HD still determines my location! When Location Services are disabled, Phoenix HD will use your IP to attempt and locate where you are. This is generally inaccurate, but sometimes might return your location as the centre of the city where you are playing the game. This location is the same for all other players that are located using IP lookup in that city, and is thus relatively anonymous. Also, other players are not able to see your location. Is your question not answered by the information on this page or in our FAQs? Just email us at support@firigames.com!